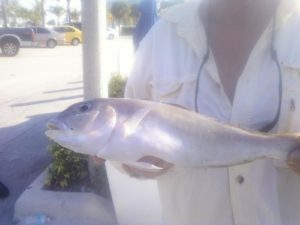 Good fishing remains the rule on our Fort Lauderdale Fishing Charters. Lots of decent sized Dorado as expected with the steady easterly wind. Some fish approaching 20 pounds. The best bite has been in roughly 400 to 700 feet. But we have been talking about Dorado for a while now, so let’s visit another species we are catching when current conditions allow. The Grey Tilefish. Doug, Martha and their kids Billy and Samantha chartered Marlin My Darlin and the primary request was to catch some fish for a fish fry. We caught the Dorado (which are first class table fare) that we have been talking so much about. It’s great to see them here . Here’s hoping they stick around. Doug being from Fort Lauderdale was really pleased with the Dorado as he had eaten them numerous times before after a Marlin My Darlin charter. Repeat customers are the backbone of our business. We love you Doug. A slight north current and a favorable sea condition allowed us to target the Grey Tiles. Not a glamorous fish, they live in holes they burrow into muddy grassy bottom in 420 to 470 feet. They don’t like to swim more than 5 feet off the bottom to take a bait. Picky picky, or maybe just smart. We fish them on 5 hook rigs (“chicken rigs”) and just enough weight to hold the bottom. Braided line so that we can see and feel the bites. Circle style hooks. Nothing glamorous, not even close, no big drag screaming runs, just the best eating fish available for Fort Lauderdale fishing Charters (if you like a fish that tastes like Lobster). We do. That’s him in the picture. A face only a mother could love (and us and Doug). Almost forgot. We love you Doug.